Get precise control of the temperature in every room of your home with an energy-efficient and whisper-quiet cooling and heating system from Mitsubishi Electric. It’s strange: We hold our dishwashers, ovens and other household appliances to an extremely high standard, but not our cooling and heating systems. Many homeowners tolerate lackluster performance that consumes energy and drives up utility bills. The explanation may be that over the past 50 years or so, one particular climate-control technology has dominated the market, and many folks are unaware that alternatives exist. Today, with so many advances in technology, homeowners can choose from a variety of compelling options to ensure year-round comfort. Among the most intriguing is the Zoned Comfort Solution™ from longtime industry leader Mitsubishi Electric. Departing from conventional technology, the zoning systems deliver highly customizable climate control with unparalleled efficiency that results in low operating costs. Though already widely popular in Europe and Asia, the Mitsubishi Electric system is just catching on here at home. So the real question is: Is this system right for your home? Read on for some key points to bear in mind. Some people choose Zoned Comfort Solutions to provide supplemental climate control to one room in their home. More common is using these systems to cool and heat the entire home. How does the Mitsubishi Electric system manage to be so versatile? In large part, it’s that the unique, streamlined design of the system enables it to scale up and down with ease. 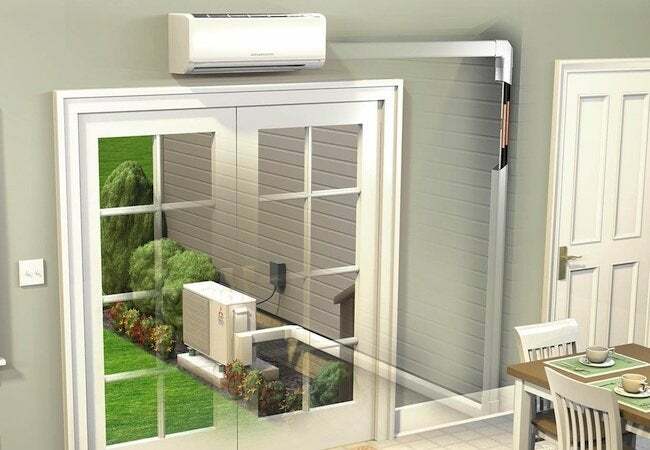 The simplest application consists of only two discrete components—an outdoor compressor-condenser (the outdoor unit) and an indoor evaporator (the indoor unit), with a single outdoor unit capable of supporting multiple indoor units. The result is you can have many indoor units as part of just one cooling and heating system. Those units can be any style you like—the style that gets mounted high up on a wall, the one that gets concealed behind a wall or ceiling and so on. There’s no one-size-fits-all approach. The right combination depends entirely on you—your needs and your preferences. No matter how you envision Zoned Comfort Solutions serving your home, you can expect the installation to involve a minimal amount of remodeling work. In fact, depending on the scope of the project, technicians may be able to complete the work in just one day. With no sacrifice of performance, the Zoned Comfort Solutions operate with remarkable, stand-out energy efficiency. Simply put, in comparison with older, increasingly outmoded systems, Mitsubishi Electric technology uses noticeably less electricity to power its normal operation. The key: A traditional forced-air system operates in a stop-and-start cyclical pattern that consumes a great deal of energy. Conversely, a Mitsubishi Electric system minimizes energy consumption by running continuously. That doesn’t mean that the system operates continuously at full capacity, rather, it monitors each zone’s temperature and modulates its output to match the demand of a room at any given time. If that doesn’t sound like a groundbreaking innovation, consider that Zoned Comfort Solutions can save you as much as 40 percent on cooling and heating (an expense that, in average homes, accounts for about half of total energy consumption). Those savings really add up, especially over the long term, putting to rest the assumption that with cooling and heating you can enjoy comfort or savings, but you can’t have both. Perhaps the most exciting aspect of Mitsubishi Electric systems is that the technology affords an exceptional degree of control. Namely, it enables you to target temperatures on a room-by-room basis. Contrast that with homes that have a traditional forced-air system where a single thermostat sets the temperature for the entire house. 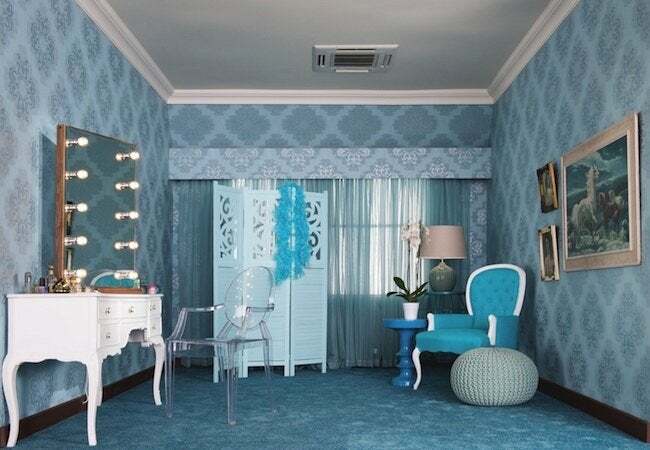 The frustration with such a setup has always been that in order to make one room cooler or warmer, you need to raise or lower the temperature for every room, all at once. This includes rooms that are unoccupied—the guest bedroom, the formal dining room and so on. 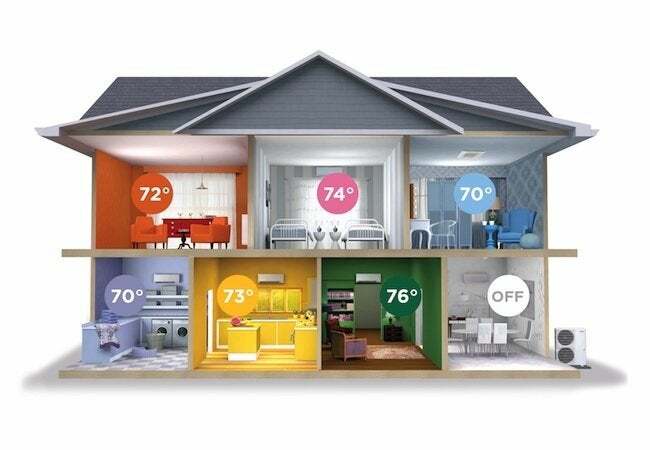 Besides wasting a considerable amount of energy that the homeowner has to pay for at the end of the month, a single-thermostat system fails to recognize different members of your household may prefer different temperatures. With zoned systems, everyone under the same roof can be comfortable at the same time. If you like it a bit cooler, you can turn down the thermostat in the zones where you spend the most time. If your children like it warmer, you can set the temperature for their bedrooms accordingly. And if you’re all in the living room, no need to waste electricity cooling unoccupied spaces. Isn’t that the way it should be? Historically, cooling and heating manufacturers have focused mainly on performance and less on aesthetics. Mitsubishi Electric sets itself apart: With their Zoned Comfort Solutions, you can choose from a range of indoor units, each with its own look. For multifunctional living spaces common to contemporary floor plans, many homeowners opt for a wall-mounted unit that, as its name suggests, mounts on the wall, often several feet above eye level. Even less conspicuous are the units that recess into the ceiling, or if enough space is available, into the floor or soffit. With their working parts fully concealed and only their air distribution vents visible, recessed units easily escape notice—a feature enhanced by their whisper-quiet operation. For an even more sophisticated option, look to the Designer Series, a new line of indoor units that goes further to prove that climate control need not conflict with home decor. Available in three colors (glossy black, pearl white and matte silver), the sleek and slim Designer Series hugs the wall, protruding mere inches into the living space. Homeowners can stick with one design or choose a different one for each room. The options are endless. 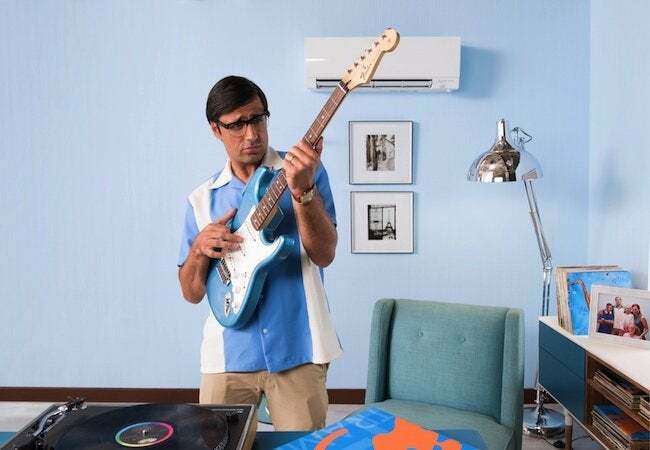 Mitsubishi Electric’s Zoned Comfort Solutions takes a fresh approach to cooling and heating—one that may forever change your mind about the meaning of, and possibilities for, home comfort. In the past, homeowners who were unaware of alternatives accepted the drawbacks of bulky, cumbersome and inflexible climate-control systems that offered hit-and-miss, energy-wasting performance. 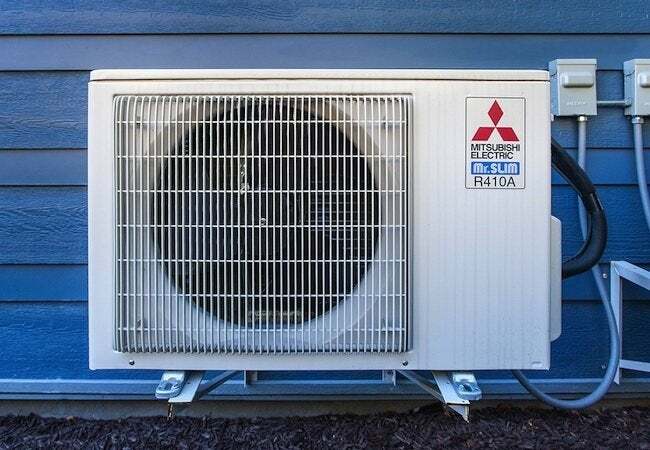 Today, thanks to innovative systems from Mitsubishi Electric, homeowners can enjoy better-than-ever climate control, probably for less money than they’re currently spending. Ready to take the first step? Go online now to MitsubishiComfort.com to locate a Diamond Contractor™ in your area. Trained and certified by Mitsubishi Electric, Diamond Contractors are always on hand to offer expert advice on integrating Zoned Comfort Solutions into your home, no matter its age, size or style. 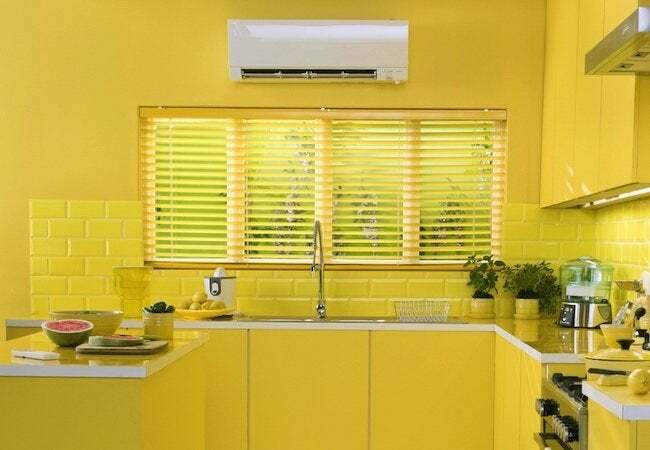 Compact, efficient and versatile, cooling and heating isn’t what it used to be—and that’s a good thing!